New merchandise, specials and discounts from Portraits of Animals! New Merchandise, Wow Am I Excited! I finishing up my latest e-newsletter, just as I’ve worked up the design and production of several new products. I recently featured cotton tote bags here, and I’ve expanded on that idea, and I’ve also designed a series of crocheted washcloths in addition to the pawprints. A close-up of a few bags. 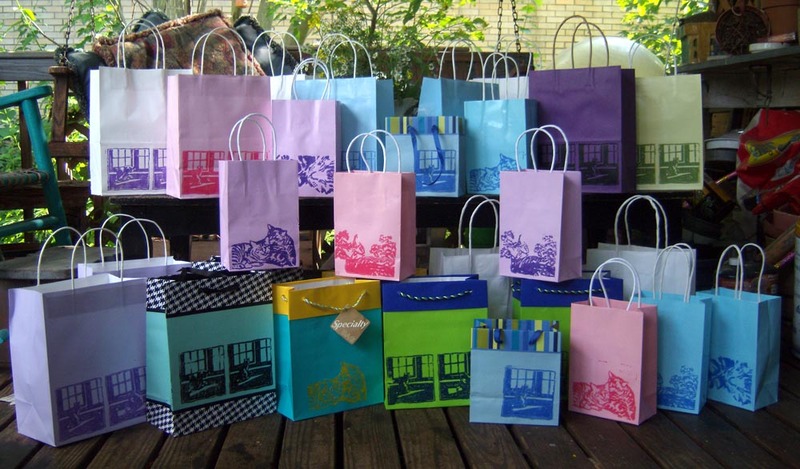 As you see above, I’ve also been working on ideas for gift bags. 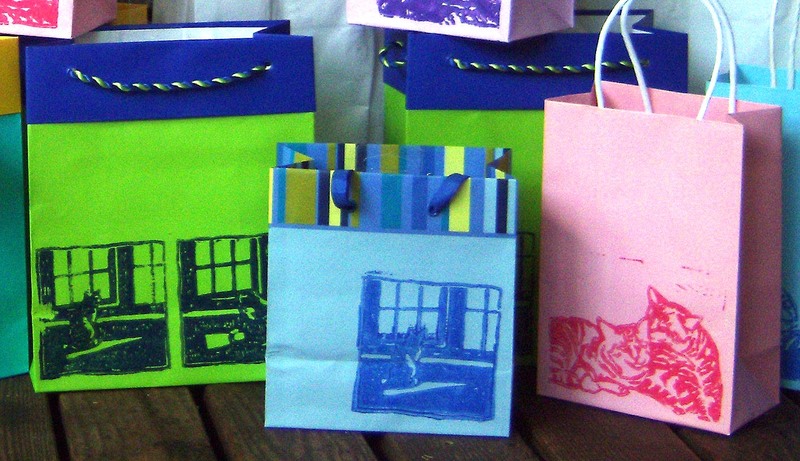 These are my “experiments” with block printing on bags, some of which worked fine, some of which did not. I purchased various styles of bags in various colors, then mixed various inks and paints to print. It was so much fun I had to stop myself before I had no more space to set them out to dry. The tricky part of it was finding a water-based ink or printing medium that would actually adhere to most bags without running when it got wet; normally I have to use oil-based ink for this, and that’s based on—guess what?—petroleum! YUK! We’ve all seen enough of that lately, it smells like tar balls and I have to use turpentine to clean it up. I don’t want me or my kitties to breathe that stuff any more. So here’s my first venture into going petroleum-free in my studio. More on that later. 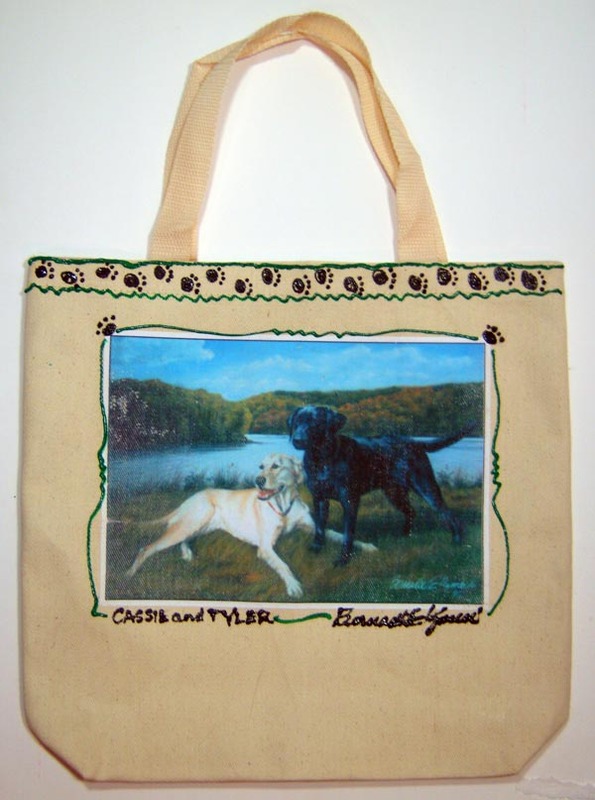 Cassie and Tyler Tote Bag--yes, dogs too! The cotton tote bags I featured last month were indeed pretty, but when put to the test by myself and others the lightweight cotton muslin just wasn’t strong enough; I usually load my bags, but I found myself being too careful about what I put in mine, which would result in not using it. I want you to have a product that you will use and will last for years, for your sake and for the sake that my kitties’ images are on them! I’ve been working with several canvas bags, and while I haven’t come up with the final bag I decided it was time to get the designs out there. 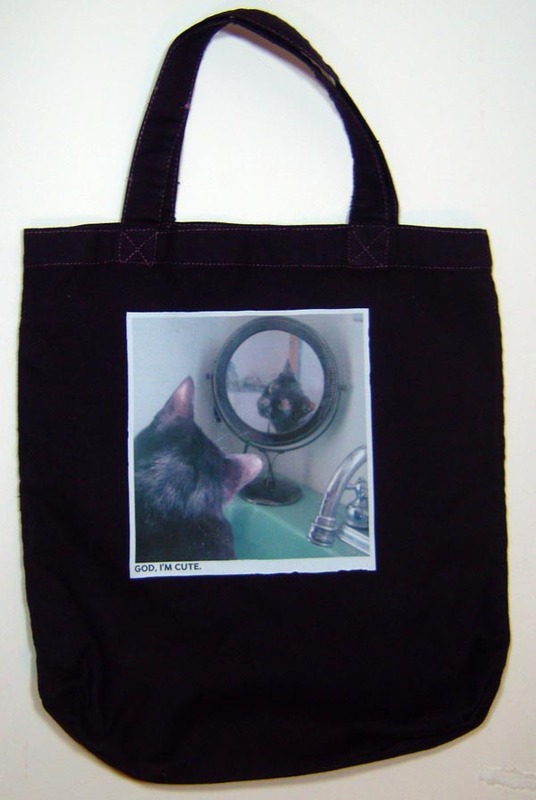 "God, I'm Cute", one of the series of my black cats featured on black bags. Really, part of designing products to sell is working out the materials and methods part of the idea, but the other part is audience response. I like these images, but I need to know what you think. While the gift bags and the tote bags are “not my final answer”, I’d love feedback on the designs. I always start out with images people have responded to generally, then find a product with which they are appropriate. Sometimes, though, I end up using things myself, so I value your opinion. 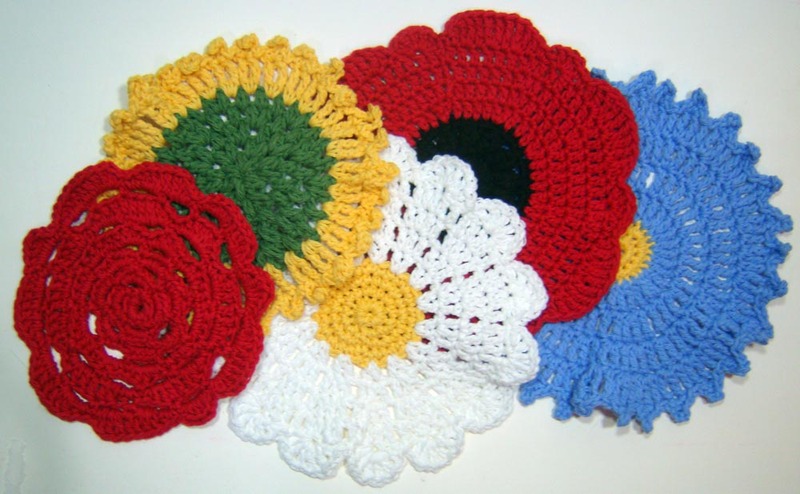 Flower Garden Wash Cloths, handmade from my own designs. I’m creating my e-newsletter in Vertical Response this time; I’m trying out each one of the e-newsletter companies to see which one has the best deal for my usage level and design needs. I prefer to use these companies rather than setting up my own e-newsletter because they are a “safe send”, meaning your identity and contact information is kept in a database at Vertical Response and isn’t retrievable from the e-mail so it doesn’t lead any spam to you, plus I’m not using my own e-mail account and won’t be considered a spammer for sending too many messages. If you’d like to receive my e-newsletter, please e-mail me privately at bernadette@bernadette-k.com. I’ll enter it in the database for this first newsletter. You can opt out later if you decide you don’t want to receive it. 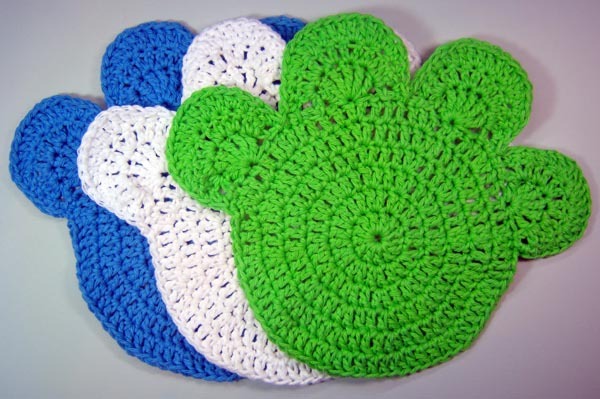 Crocheted Pawprints, the "Brights" set. 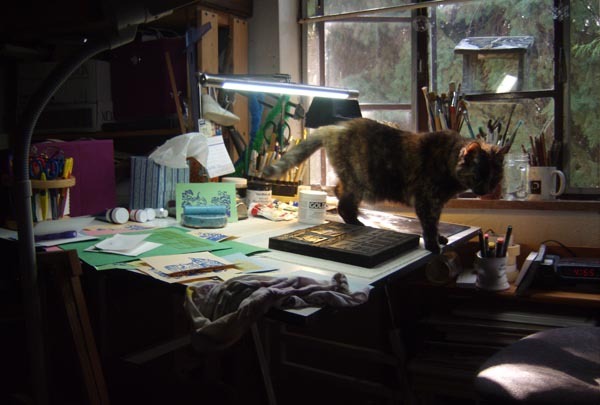 My quarterly e-newsletter includes information about all of my work here in my studio, including my commercial art—graphic design, web design, illustration, writing, photography, etc., etc. It’s a way to let people who know me for one discipline learn about what I do in another and see all the influences in my life. This entry was posted on Monday, June 21st, 2010 at 12:24 pm	and tagged with canvas tote bags with animal art, crocheted washcloths, gift bags with animal art, gift bags with cats, tote bags with cats, tote bags with dogs and posted in cat merchandise, dog merchandise, gift bags, linoleum block prints, new designs, things in my shop, tote bags. You can follow any responses to this entry through the RSS 2.0 feed. Follow Me to the New Portraits of Animals! Follow my Marketplace blog on Portraits of Animals. Original art and prints, greeting cards and animal sympathy cards, photos, apparel and housewares featuring cats, dogs, wildlife, wildflowers and scenes from nature, for the whole menu visit Portraits of Animals.